My “Best of 2016” post suggested that during 2016 I was not overly impressed by the burgers I ate in Cardiff (not many, if truth be told), but working the graveyard shift in that weird week between Christmas and New Year (quite good for catching up on stuff as phone rarely rings – amazing how much quicker stuff gets done when you have very few phone calls) gave me the opportunity to try out the new kid on the block (having been unable to attend their launch event) in the form of Burger Theory at Kongs in Cardiff city centre. 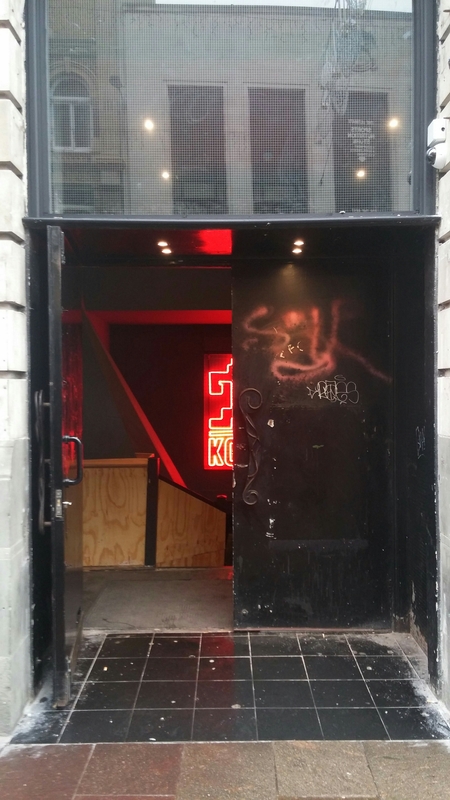 The exterior facade is pretty minimalist, with a small sign and very non – descript entrance. It is, for oldies like me and the other sap working the graveyard shift who came with me, not exactly a sight that entices you in. 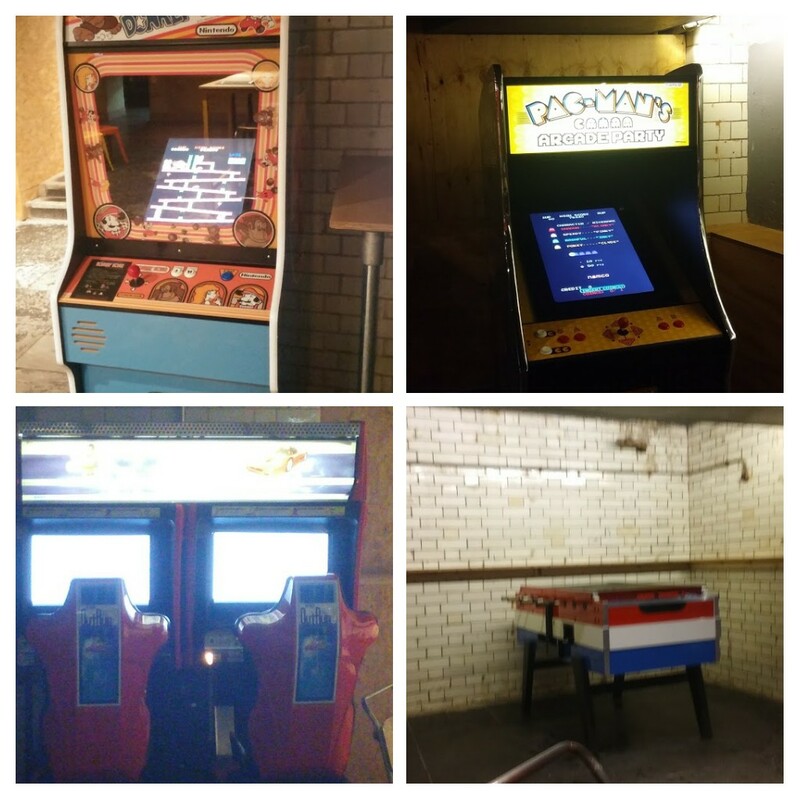 and some very retro arcade games machines, as well as a foosball and table tennis tables. I didn’t have a go on any of these, as when I had the advantage of youth reactions wise I was useless at most of them (with the exception of Defender and Hang On at which I was moderately competent). I fear my age addled reflexes would make any attempt at playing on them now utterly embarrassing (my last go on a video game resulted in humiliation – playing a PS3 Formula 1 game – at the hands of my friend Rachel’s 6 year old son, who luckily interpreted my constant profaning at my ineptitude as “chick” rather than what I was actually saying) . 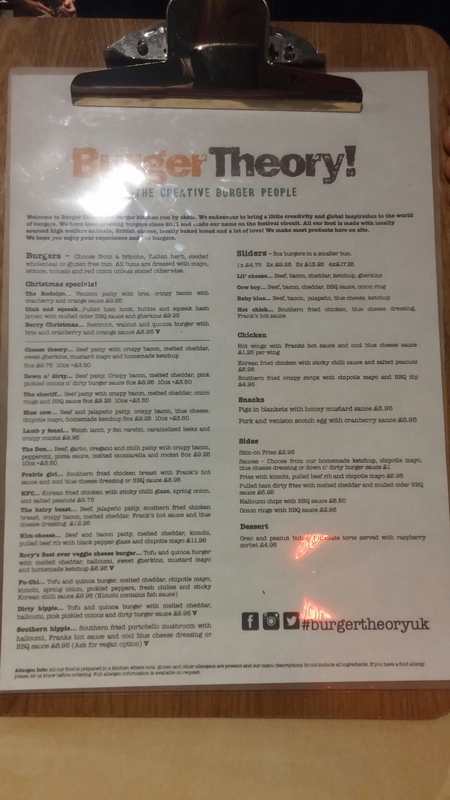 Burgers are the name of the game on the food front here, with Kongs continuing in Cardiff their Bristol born partnership with Burger Theory (for some reason my dyslexic and dyspraxic brain seems to reads it as Therapy rather than Theory). The nice variety of burgers in term of both patties and toppings, pretty much cover all bases (beef, lamb, chicken and more – 3 as it has been pointed out to me that menu states the kimchi in the otherwise veggie fu – chi contains fish sauce – than the usual quota – 1 – of veggie burgers). I am a man of simple tastes (as it seems is my friend – who ordered the same burger as me) and with a burger I tend to find more is less. 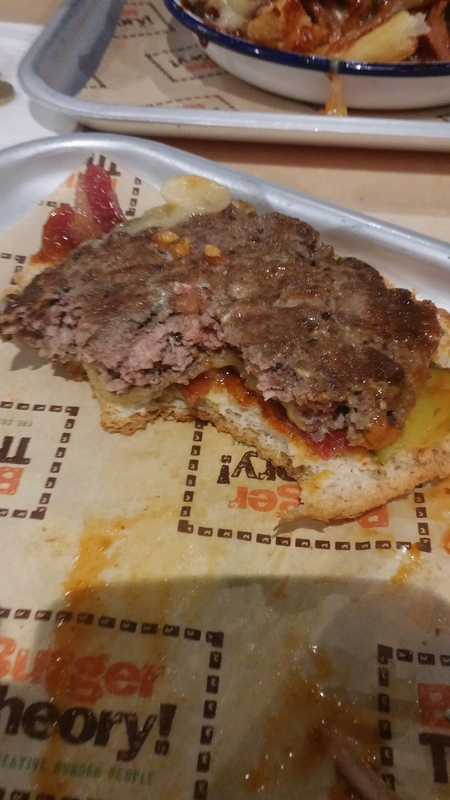 I, therefore, usually order a fairly minimalist burger, which lives or dies on the quality of the patty (with the added bonus that they also tend to be cheapest!). 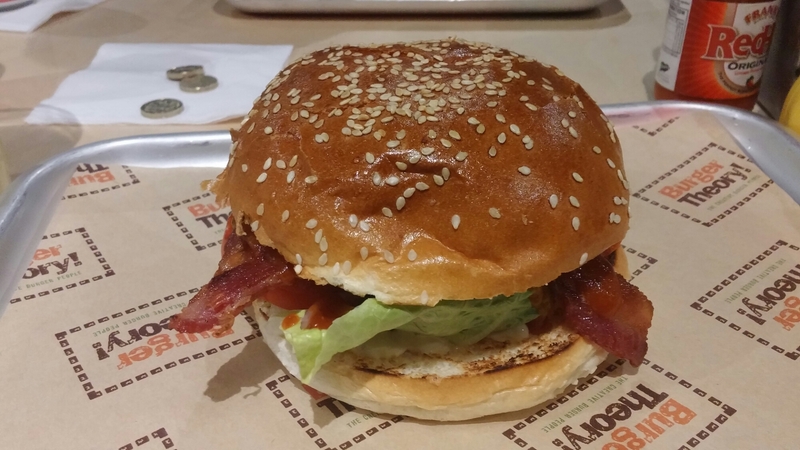 Here that burger was the “cheese theory” (a far from cheap £8.75 with fries extra), a cheese burger with the addition of bacon (very little is not improved by adding bacon), lettuce, tomato, mustard mayo, a homemade ketchup. On the bun front there is a choice of brioche, Italian herb or wholemeal. Being opposed to anything wholemeal (personally think it is a Anglo – Saxon myth that that stuff is good for you, very rarely see it in Mediterranean countries whose diet is famously heathy as opposed to that of the US and UK which isn’t) and was not sold by the Italian herb option, so I went for the brioche bun. and a very juicy, well flavoured and nicely seasoned, patty. It was a bit lacking on the cheese front though – was its name intended to reflect that it was more cheese “in theory rather than in reality”? The picture doesn’t show it, but there was a hint of pink to the interior and a decent char to its exterior. I inexplicably didn’t ask if I could have it medium rare (I was distracted by the fact I couldn’t read the menu text – tiny type face and varifocals don’t work that well in my experience – and through my confusing the bar tender by referring to it as Cheese Therapy not Cheese Theory). I cannot therefore say if they would cook to medium rare on request, but the lack of an FSA mandated warning regarding the perils (Biblical plagues, zombie apocalypse, Skynet becoming sentient etc.) of burgers being cooked at less than medium suggests not (but I could be wrong). Notwithstanding it being cooked a touch over how I prefer my burgers, I thought it a very decent patty. Quality meat in a good sized, not overworked, patty. It had that nice yielding texture, as you bit into it, of a hand formed patty. My only slight qualms were the sweetness of the homemade ketchup and the minimalist approach to cheese on what was billed as a cheese burger. 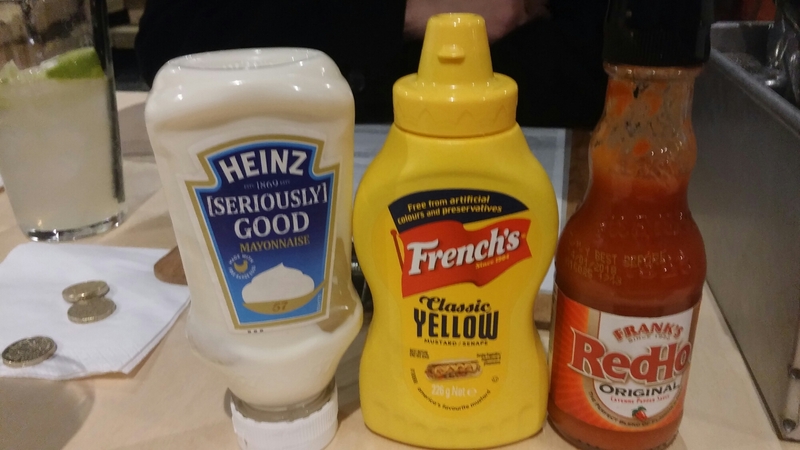 based on the options on the table (probably just the mustard) rather than have it automatically added (in quite large quantities) and on the cheese front just a bit more of it would have been nice. I like the idea of the sliders on the menu – which give you the ability to sample more than one option. Odd though that these do not cover any of the veggie options. May not want a whole one but as part of a selection of sliders I would be tempted to order a veggie one (the Southern Hippie sounds particularly appealing). The sides are more limited than those available at the Kongs in Bristol (I was a tad disappointed not to see the Duck Mac & Cheese on the Cardiff menu), but still has lots of nice sounding options. We went for the pulled ham (despite getting a bit tired of the continuing obsession for pulled everything – waiting for scrambled eggs to be called pulled eggs by some place or for cheese strings to be rebranded as “pulled by you” cheese, which would be very much a case of pull the other one) dirty fries with cheddar cheese and mulled cider BBQ sauce (£6.95) to share. This was a big portion, with plenty of meat, and easily big enough for the two of us to share. satisfying dirty, it was very nice if a touch (as with the burger ketchup) sweet (due to the mulled cider BBQ sauce) for my tastes. 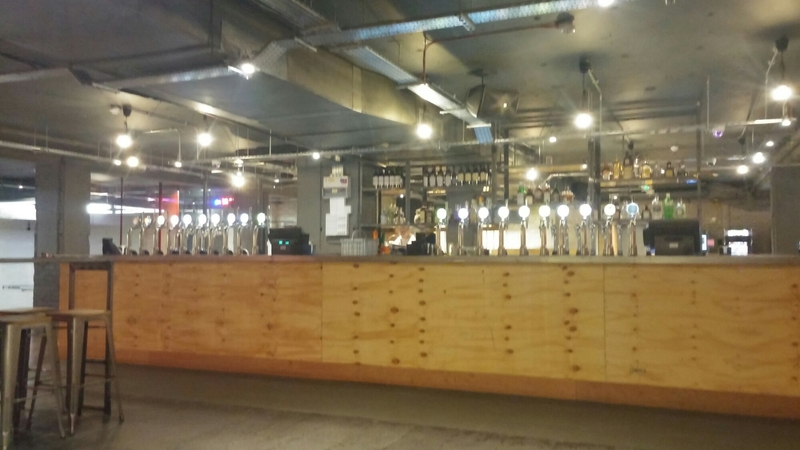 The place centres on beers, with a wide selection of cask, keg and bottle and canned beers. 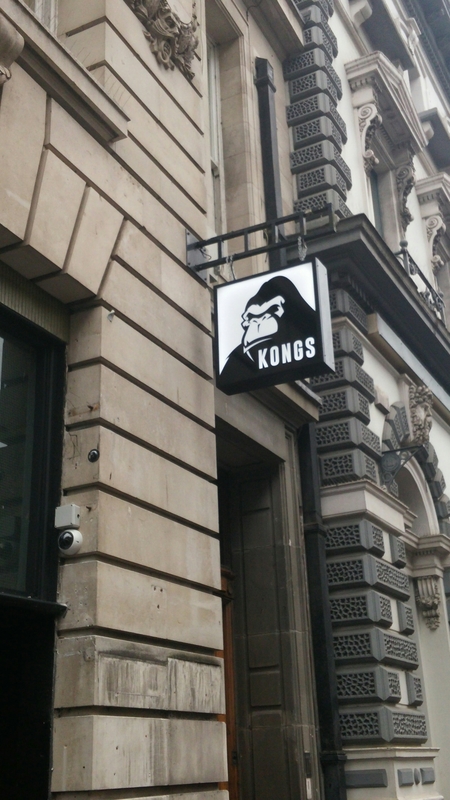 The drink section of the website for Kongs in Bristol (Cardiff site not populated at time of writing this) gives an indication of the breadth of what is on offer. 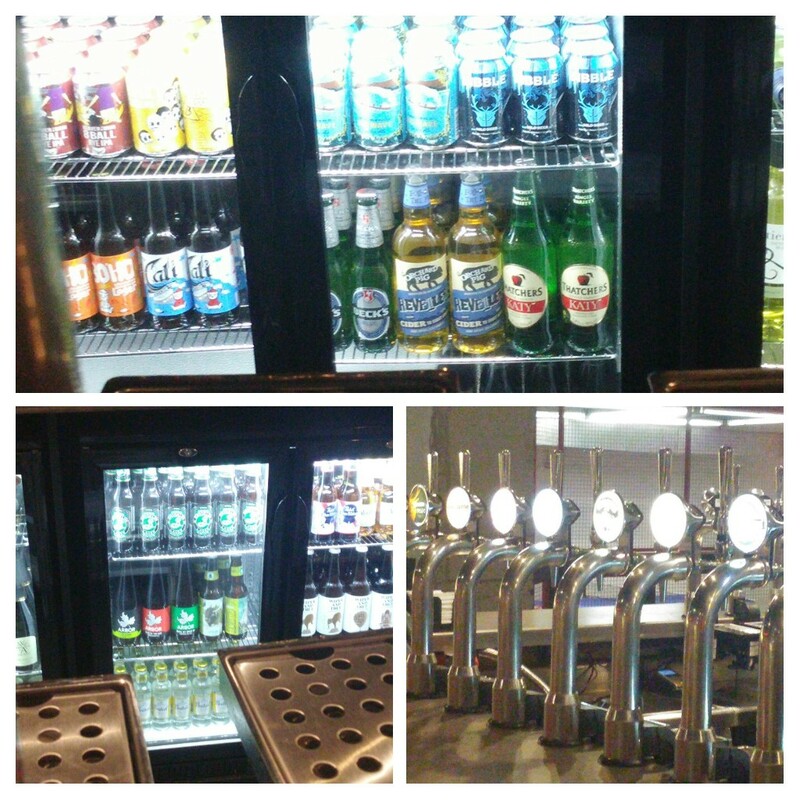 Nice to see some local beers. I spied some Tiny Rebel and (I think – eyesight not as good as it use to be) Crafty Devil stuff. Looks a decent place for a drink, if you like a proper beer rather than yellow flavourless slop (regrettably they do seem to sell that in the form of Heineken unless my aged eyes were deceiving me). It being a working day lunch we were on the soft drinks and there is a reasonable selection outside of the bog standard sodas. Things like Jamaican ginger beer and Ting make for an ok offering for those not able or wanting to drink booze. Not sure of the price – around £1.50 I think – for the ginger beer. I thought the burger at Kongs was rather good. Whilst not cheap (we each paid around £13.50 all in – not 100% sure how much soft drinks were – which is close to London prices), what you get for your money is a very substantial meal of quality stuff. 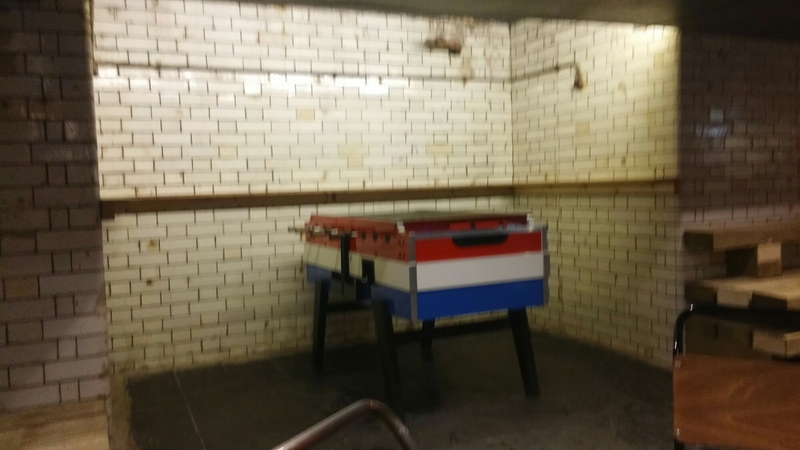 Add to that a very decent booze selection and the ability to make a complete arse of yourself playing arcade games, foosball or table tennis and you have a pretty good venue in my book. More “in reality rather than in theory” cheese and less ketchup would have taken what was, after all, billed as a cheese burger from really rather good to really very good. On the price front there are some very good offers on Wriggle for burgers at this place (seem to be late afternoon/ evening rather than lunchtime which is shame for me). Well worth a look these. Would I go back? 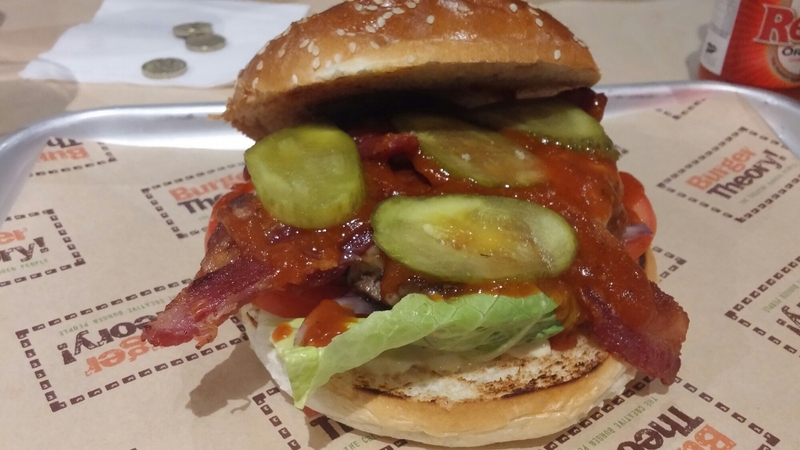 Yes – quite possibly Cardiff’s best burgers at the moment. Probably take advantage of a Wriggle offer next time eat here mind. Definately closer to King than Donkey, Kong wise, in my view. Opening hours : Mon – Wed: 16.00 – 01.00; Thursday: 16.00 – 02.00; Fri – Sat: 12.00 – 02.00; Sun: 12.00 – 24.oo. 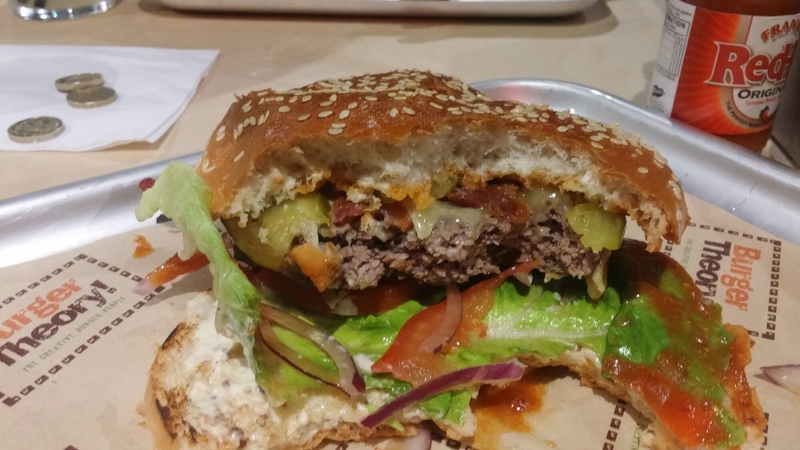 Love a decent burger but hate, hate, hate forking out (London) prices for a shite one… there are very few things more disappointing than a sloppy, mess of a burger! These look solid! Great write up – I’ll have give it a whirl sometime. Good tip about Wriggle, I’ll keep an eye out. 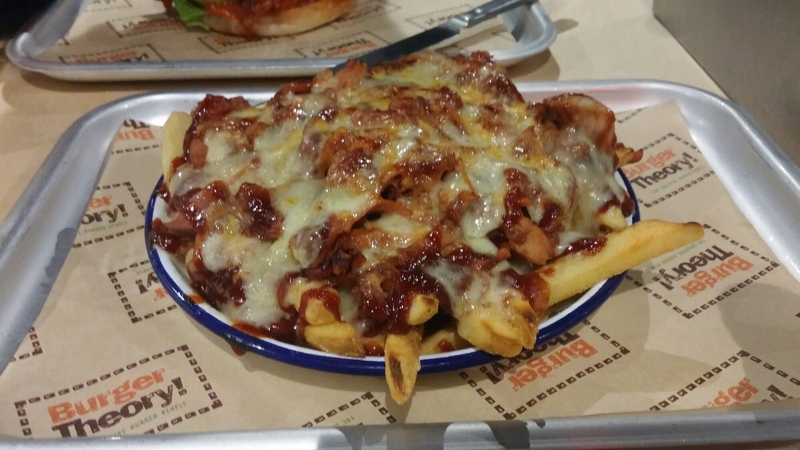 This entry was posted on Jan 8, 2017 by solicitingflavours in Alcoholic drink, American food, Bacon, Beer, bitter, Burger, Burger Theory, burgers, Cardiff, Cardiff restaurant, cheese, cider, craft beer, Drink, Food, Fried chicken, IPA, Kongs, lunch, lunchtime, New restaurant Cardiff, Non alcoholic drink, Pub, pub lunch, Real ale, Restaurant Review, review, Sandwich, Uncategorized, Wales.